The news has been filled with contention over Egypt’s November elections, but far less attention is being paid to the voting in Tunisia—also recently liberated from the rule of a dictator. More than 100 political parties participated. Tunisia’s October balloting was designed to elect members of the 217-member assembly that will deliberate and draft a new constitution and form a parliament. On the scene as an international observer, former U.S. First Lady Rosalynn Carter noted, “It appears that everybody wants a good election—the politicians, the military (who are not political), the powerful trade unions, the police, the people—and everything is being done with compromise to make this happen.” Many in the Arab countries now view these elections as a prototype, and they prominently displayed the characteristics celebrated in modern political thought. Clean elections, of course, do not occur spontaneously. So how did this happen? With 40 percent of the population under 25, unemployed college graduates were the first to activate themselves after Bouazizi’s death. Their efforts galvanized towns such as Thala, Sbeitla, Sidi Bouzid, Regueb, Douz and Kairouan—located in the neglected interior, as opposed to the coastal areas that had been endowed with monies to support tourism and development. With little hope for employment and no delusions, they led the revolt. Indignation then turned into social upheaval and spread throughout the central and western regions. A 31-year old man self-immolated himself in Metlaoui on January 5, the day that 5,000 attended the interment of Bouazizi. In this mining town of 50,000, the local branch of the main union, the Tunisian General Union of Labor, well knew that 40 percent of the active population was unemployed and 75 percent of employees had been laid off in the previous 25 years. As Metlaoui heated up, the neighboring towns of Kasserine and Thala did too. Workers and Tunisia’s educated young were now in alliance. The parents and grandparents of the young soon joined them. Early in the Zine el-Abidine Ben Ali regime, political activists began watching the extent of his clan’s corruption. As the family took over national enterprises during its 1995–2005 privatization schemes, their corruption became common knowledge. Beside unemployment, ending a culture of endemic, systemic corruption and impunity became a priority for Tunisians. After a strike in the Tunisian city of Hawd el-Mongamy, young online organizers set up what became the Progressive Youth of Tunisia. Organizers in Egypt and Tunisia began exchanging views over Facebook. According to Piot, one in three Tunisians use the Internet. Egyptians were persuaded that Tunisians faced a more severe police state than their own because of Tunisia’s strict controls on blogging and press freedoms, but they perceived Tunisian labor unions as more powerful and independent. To Egyptians, Tunisia’s revolt was more “modern” and politically mature, because its discourse was that of educated, literate classes, who spoke the language of human rights, liberty, citizenship and democracy. Police repression against young demonstrators from poor areas swelled and recoiled, causing a second detonation on January 7 and 8, 2011. Tunisians burst with simmering resentment against the 150,000-strong police forces, long recognized for their arrogance, corruption and contemptuous behavior. During Ben Ali’s 23-year rule, Tunisia’s civil-society organizations suffered severe, stifling repression. Yet they now emerged as politically important with their large networks of associations, radio stations, musical bands, clubs and human rights groups. Some claimed an apolitical identity, including Amnesty International. Others expressly came into being to oppose the Habib Bourguiba regime (1956‒1987), and then that of Ben Ali. Among these is the Tunisian League for Human Rights; founded in 1976, it is the oldest advocacy group of its kind in the Arab world. With all political organizations dubbed the “illegal opposition” in Tunisia, the student movement—avidly organized during the 1970s and 1980s in the General Union of Tunisian Students—had gone underground years earlier. Yet the UGTT’s web of trade unions meant that local leaders were in place. These dispersed power centers, if mobilized, could represent a diverse opposition against the regime. Ben Ali’s closing of all educational establishments on January 10 finally provoked the UGTT labor unions to react. They gave the go-ahead to locals in Sfax, Kairouan and Tozeur to organize a general strike for January 11 and 12, and in Tunis on January 14. Workers may have sparked the uprising, but as it spread to the middle classes, the nation’s academicians, bankers, doctors, lawyers and shopkeepers became engaged. This reach matched the geographic spread of the protests. Tunis, Sousse, Sfax, Gafsa, Gabès and Bizerte—the largest cities—rose up in turn, especially after the successful January 12 general strike in Sfax. Professionals, traders, merchants and financiers came on board, many of them allied with the Bourguiba regime and with Ben Ali in his early years. The ranks grew of those who felt embittered about being pushed aside by Ben Ali’s networks, especially the Trabelsi clan of his second wife Leila. In Sousse, a city favored by tourists, workers from the Farhat Hached hospital organized a massive protest march. They were soon joined by hotel employees. The upheaval expanded to the upper crust as, on January 8, a delegation of business executives from Sousse, Ben Ali’s base, called on the presidential palace in Carthage to ask the president to step down. On January 14, Ben Ali left Tunisia. Even if subdued, the free-standing civil-society networks with independent leadership provided Tunisia with what Gene Sharp calls the capacity for “corporate resistance and defiance.” As I have previously written, a clear link exists between the cohesion of a nonviolent civic coalition during the years prior to a democratic transition and the depth of its self-governance in the outcome. Elections initially set for July were postponed to October. Some worried that only the Ennahda Islamist party was sufficiently organized to mobilize supporters. Although initial discussions concerned presidential elections, as a result of strong popular resistance to choosing the executive before a parliamentary process was underway it was decided that the Constitutional Assembly should be elected first. A post-Ben Ali prime minister, Beji Caid Essebsi, dismissed the cabinet, replacing it with individuals said to have few political ambitions. An independent election committee was established, named the High Commission for the Fulfillment of Revolutionary Goals, Political Reform and Democratic Transition, led by a constitutional lawyer, Yadh Ben Achour. Watching at 28 polling stations, Rosalynn Carter filled out forms reporting on the balloting procedures. She was surprised by the high participation of women and sweeping tolerance for long hours queuing to vote. The process, of course, was not without problems; she observed that the illiterate were not, according to election rules, allowed to have help in casting ballots, and that only 7 percent of the young were registered to vote—perhaps because, despite having kicked off the national revolution, they had tasted few of its fruits. Some have been troubled by the fact that Ennahda won 41 percent of the vote, or 89 seats. It was the Islamic party most repressed by Ben Ali, partly because of its strong showing against him in the 1989 legislative elections. With gender parity mandatory for any party’s list presented, women took one quarter of the available seats, and, among those, 71 percent are affiliated with Ennahda. Such a rebound is to be expected in largely Muslim countries like Egypt and Tunisia, where Islamist parties were forced underground and appear to many as the most distant and viable alternative to the ancien régime. The rest is history, so to speak. 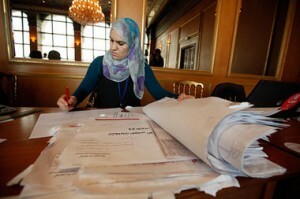 Tunisia has a hopeful future, thanks to the hard work of many over the past year.